The Nogaro has been designed from a clean sheet of paper to appeal to owners of a wide variety of sports, classic and GT cars. 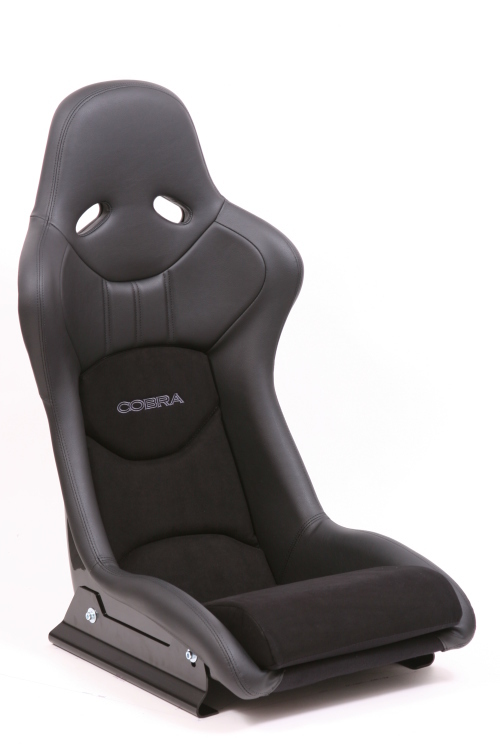 Although it is built to Cobra exacting motorsport standards, this is a seat that is designed to be as much at home on the school run, as it is on the Nordschleife. Despite being very supportive, the design has also been carefully balanced to ensure long distance touring comfort and easy entry and egress. To this end, the seat shell has been carefully sculpted to hold the shoulders and hips, but with lower profile side bolsters on the base to allow quick and easy entry. Two shell options are available to suit all tastes, pockets and weight-saving requirements. Choose from either the GRP version at a scant 10.2 Kg, or the featherweight carbon fibre variant at an unbelievable 5.3 Kg. No matter what OEM seat you are running, these will save an incredible amount of weight over the factory pews. Seats can also be ordered in two styles; "Street" looks right at home in anything from a fully sorted Audi to a highly fettled Porsche, whereas the "Circuit" version offers the same good looks, but with the added benefit of harness slots for those that like to venture out on track or at least look like they do. Better still, the seats side profile has been carefully optimized to work perfectly with all factory seatbelt systems and side curtain airbags.